Jayda - Diamond in the Ruff Rescue & Rehab, Inc.
Jayda is a sweet, loving, outgoing 3-year-old Boxer. She came to us from an animal Shelter after another rescue took her puppies and left Jayda behind. Upon intake, we learned that Jayda was Heartworm positive. Since our rescue has a policy to not turn down a Heartworm positive animal, we agreed to take Jayda and have treated her for the heart worm. Today, Jayda is in foster home with many other dogs and loves to have playtime with them. She is often found running around in the yard and playing around with the other dogs. Jayda is a low to medium energy dog who is eager to please. Jayda is very comfortable around people and will patiently lie at your feet, looking back at you for attention and approval, or sit next to you and hand you her paw. She is extremely friendly and was immediately a huge hit with her foster dog siblings when they were introduced. 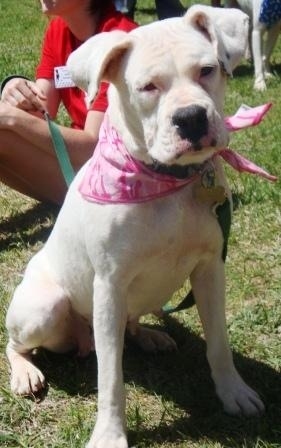 Jayda is a white boxer and will need to be kept as an indoor dog. While we have no objection to Jayda spending time outside to play and to do her business, she is not to be kept as an outdoor dog. White boxers are susceptible to the weather. They can become sun burnt if left in the sun, or wind burnt if exposed to the wind. Jayda has finally found a forever home where she will be carefree for the rest of her life.